Performance Metal Roofing | Modified Bitumen Roofing | ME and NHPerformance Roofing, Inc.
It’s easy to see the value in buying Modified Bitumen Roofing. 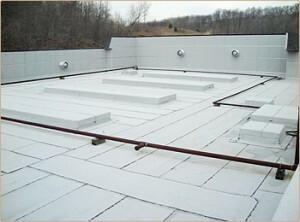 Modified Bitumen (MB) roofing is an asphalt-based, close cousin of the Built-up-Roof (BUR) designed for buildings with low-slope or “flat” roof structures. Engineered modified bitumen roofing membranes originated in Europe in the mid 1960’s and have been used successfully in the United States and Canada since approximately 1975. MB gives designers and installers an even broader array of options than BUR. MB may be installed by the torch-application method, or “hot-mopped” like BUR, or applied with “cold-process” adhesives. The latest innovation with MB is the self-adhering sheet. Using special combinations of polymers to modify the underside of the MB sheet, the rolls are manufactured with a release paper. The installer removes the release paper and as the sheet is rolled out, it adheres itself to the substrate. This method eliminates the risks associated with the use of torches, hot asphalt, and is completely free of volatile organic chemicals (VOC) fumes during and after application.